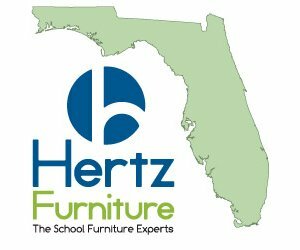 Hertz Furniture, the premier school and office furniture supplier, won the title "Charter Schools Champion Vendor" during the annual Florida Charter School Champions Awards. The event, which took place on November 15, 2012, was hosted by the Florida Consortium of Public Charter Schools (FCPCS) – the state's leading charter school advocacy and support organization. The award ceremony celebrates individuals who excel in their work on behalf of the charter school movement and gives thanks to people it considers their most valuable contributors. Other award categories included in the event are: charter school principal, community leader, teacher, pioneer, and more. Accepting the honor on behalf of Hertz Furniture were Regional Client Relationship Manager Alain Pin and National Projects Coordinator Jennifer Urogi. FCPCS President Robert Haag had this to say: "Working with quality vendors is essential to a charter school's success. Hertz Furniture System and their representatives in Florida, including Alain Pino, truly understand the important role they play in the success of a school. This recognition is our way of thanking them and everyone who makes charter schools in Florida better." For almost 50 years, Hertz Furniture has been fostering student achievement and supporting educational programs by providing premium furniture at competitive rates for K-12 classrooms, as well furniture and equipment for school cafeterias, science laboratories, playgrounds, and more. Bringing technology into the classroom, Hertz Furniture offers digital interactive whiteboards, electronic multimedia pens, wireless tablets, mobile power stands, and other high-tech products. To accommodate special needs students in the school environment, Hertz Furniture offers ADA-compliant tables and desks and wheel-chair accessible computer workstations. "We are thrilled to accept this wonderful award from the FCPCS," said Hertz Furniture President Saul Wagner. "We are proud of our longstanding partnership with the charter school community and remain committed to providing student-centered furniture which enhances scholastic performance, which facilitates teaching and learning, and which creates safe school environments."